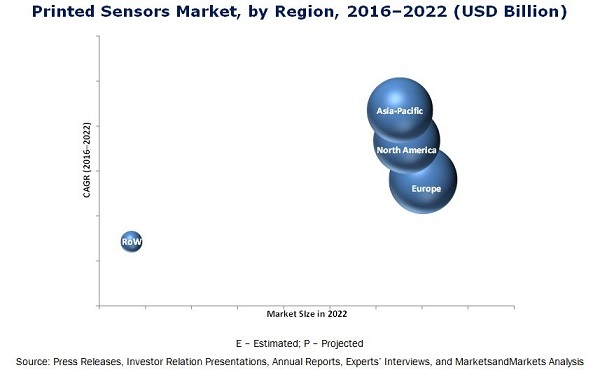 The printed sensors market was valued at USD 6.71 Billion in 2015 and is expected to reach USD 10.46 Billion by 2022, at a CAGR of 7.0% during the forecast period. The growing application of printed sensors in wearable medical devices and in consumer electronics is a major driver for the printed sensors market. Additionally, some of significant opportunities in the future for the printed sensors are the growing trends of touch-enabled electronic devices and Internet of Things. The base year used for this study is 2015 and the forecast period is between 2016 and 2022. The printed sensors ecosystem comprises raw material vendors such as FlexEnable Limited (U.K.), T+ink, Inc. (U.S.), Brewer Science, Inc. (U.S.), DuPont (U.S.), and Palo Alto Research Center (PARC) Inc. (U.S.) among others and printed sensor manufacturers such as Interlink Electronics, Inc. (U.S.), Thin Film Electronics ASA (Norway), ISORG (France), Peratech Holdco Ltd (U.K.), and KWJ Engineering Inc., (U.S.) among others who sell these sensors to end users to cater to their unique requirements. The end users are from a wide range of industries such as medical devices, consumer electronics, environmental monitoring, building automation, automotive, and many others. The study answers several questions for the target audiences, primarily, which market segments to focus on in the next two to five years for prioritizing efforts and investments. The printed sensors market was valued at USD 6.71 Billion in 2015 and is expected to reach USD 10.46 Billion by 2022, at a CAGR of 7.0% between 2016 and 2022. The growth of this market is propelled by the advantages offered by printed sensors over conventional silicon-based sensors. Unlike the conventional sensor technology, printed sensors are flexible, thin, lightweight, and organic. The disadvantages of conventional sensors such as rigidity, bulkiness, and complex architecture among others are largely overcome by printed sensors. Thus, the demand for printed sensors is expected to grow significantly in the near future. The printed biosensors lead printed sensors market. 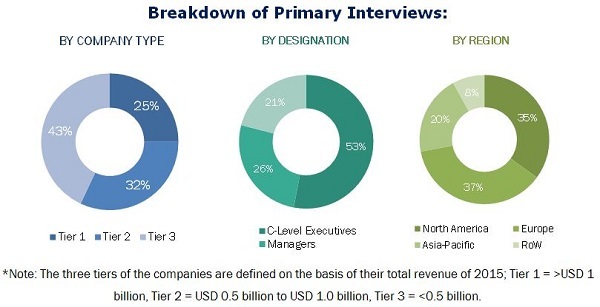 The large market share of printed biosensors is attributed to the high demand for glucose test strips which are used for diabetes monitoring and are the most matured type of printed sensors. Moreover, the rapid technological advancements, growing demand for glucose monitoring in diabetic patients, and rising demand for home-based point-of-care devices are the significant growth drivers for the printed biosensors market. In addition to this, the growing integration of biosensors in consumer electronics and environmental monitoring applications also contributes to the large market share of the printed biosensors market. Europe held the largest share of the printed market in 2015, while the market in Asia-Pacific is expected to grow at the highest rate during the forecast period. The high growth of the Asia-Pacific market is attributed to the presence of a number of leading consumer electronics manufacturers, rapid industrialization in the region, the growth in the production of commercial as well as non-commercial vehicles with driver assistance systems and touch infotainment systems, and the increasing number of patients of lifestyle diseases such as diabetes. One of the key restraining factors for the companies operating in this industry is the selection of the right materials for the sensor. The materials used in the fabrication of printed sensors are substrates and electrically functional inks. The obstacles in terms of the low electrical conductivity and high resistance of the ink are a major restraint for the development of printed sensors. It is also essential to choose suitable printing methods along with the right conductive ink to cater to the growing requirements of high-precision advanced medical or electronic devices. ISORG SA (France) is a major player in the printed sensors market and holds a leading position in developing printed image sensors and photodetectors with organic materials. ISORG is a pioneer in developing photodetectors and image sensors using organic and smart substrates such as plastic and glass. The company’s sensors are very robust as well as scratch and dust proof, which makes them compatible with the industry environment and easy to use. Through its products, the company serves various applications such as consumer electronics, home appliances, smart building & lighting, industrial, health care & life sciences, safety & security, environment, and toys & education.